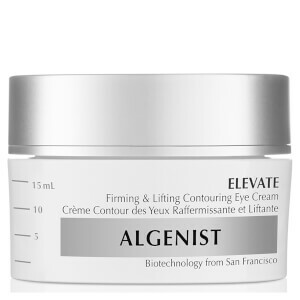 Awaken the eyes with the ALGENIST ELEVATE Firming and Lifting Contouring Eye Cream; a nourishing formula that combats sagging skin. Enriched with a potent blend of Alguronic Acid and ProPeptide3, the firming eye cream envelops the skin in an essential veil of nourishing moisture. The anti-ageing solution also promotes a lifted and youthful appearance, by visibly tightening the skin and improving elasticity. 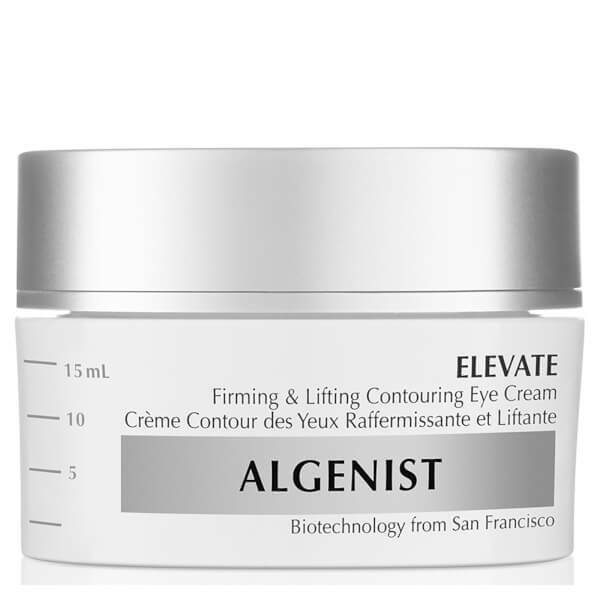 Complete with optical diffusers, the cream boasts the ability to blur imperfections and leave the delicate eye area ultra-smooth. Expect the eyes to appear refreshed and rejuvenated. Apply to the eye area twice a day. Use only as directed. Water (Aqua, Eau) , Glycerin, Isostearyl Neopentanoate, Butylene Glycol, Butyrospermum Parkii (Shea) Butter, Dimethicone, Sorbitan Stearate, Pentylene Glycol, Cetearyl Alcohol, Cetyl Alcohol, Di-C12-15 Alkyl Fumarate, Glyceryl Stearate, Neopentyl Glycol Diheptanoate, PEG-100 Stearate, Algae Exopolysaccharides, Palmitoyl Tripeptide-1, Palmitoyl Tetrapeptide-7, Arginine/Lysine Polypeptide, Hydrolyzed Rice Protein, Hydrolyzed Lupine Protein, Acetyl Dipeptide-1 Cetyl Ester, Albizia Julibrissin Bark Extract, Sigesbeckia Orientalis Extract, Gold, Caffeine, Medicago Sativa (Alfalfa) Extract, Chamomilla Recutita (Matricaria) Extract, Adenosine, Silica, Citrullus Lanatus (Watermelon) Fruit Extract, Lens Esculenta (Lentil) Fruit Extract, Pyrus Malus (Apple) Fruit Extract, Acrylates/C10-30 Alkyl Acrylate Crosspolymer, Aminomethyl Propanol, Synthetic Fluorphlogopite, Polymethylsilsesquioxane, Sodium Stearoyl Glutamate, Sorbitan Laurate, Hydroxyethylcellulose, Carbomer, Siloxanetriol Alginate, Acetyl Hydroxyproline, Polysorbate 20, Sodium PCA, Sorbic Acid, Sodium Lactate, Disodium EDTA, Tin Oxide, Ethylhexylglycerin, Sodium Benzoate, Chlorphenesin, Caprylyl Glycol, Phenoxyethanol, Titanium Dioxide (CI 77891).